If this lack of access to a grocery store wasn't bad enough, the USDA argues, corner stores and fast food restaurants like McDonald's, Taco Bell, and Pizza Hut encourage poorer individuals to eat less healthy foods just to save a buck. These food deserts, and the fast food joints that infest them, are exacerbating our current epidemic of obesity by preventing poor people from eating healthy foods, or so we are told. 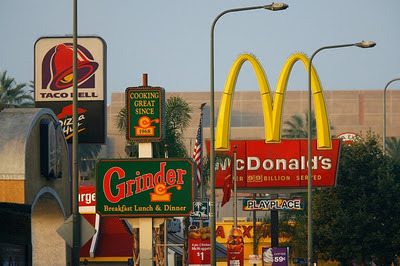 As for the fast food restaurants, while these establishments are generally selling excessively processed, nutrient-devoid, taste enhanced, near-meat foods, the health problems associated with food deserts (e.g., obesity, diabetes, heart disease) go well beyond cheap chicken nuggets, Big Macs, bean burritos, pepperoni pizza, and giant cups of soda. If the USDA is going to poo-poo all over fast food restaurants, then they have to also be critical of the supposed oasis of healthy eating: The grocery store. 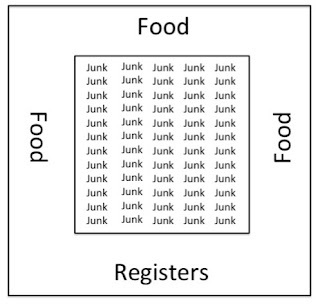 While the outside of a grocery store is filled with the stuff generally recognized as healthy (produce, meat, dairy), the center aisles are completely full of junk (see the illustration below by Chris Masterjohn). These highly-processed convenience foods represent a food dessert too. All convenience foods are a symptom of the modern Western diet and lifestyle, where preference is given to cost, speed, and taste instead of more slowly prepared, healthful, nutrient-dense foods. Engineered foods that come in a bag, box, or can. Foods with a long shelf-life are usually heavily processed, chemically preserved, taste enhanced, and/or missing nutrients that were present in its raw ingredients. This creates a situation where a person is malnourished with a full stomach. So it seems that in the West we all live in a giant food dessert, filled with foods that are not designed to support humans health, only to taste so good that you will eat (and buy) way more than you need. It's all simple economics: Cheaper, faster, and more delicious. Until the USDA acknowledges this reality, then obesity (as well as heart disease and diabetes) will continue to be an unnecessary epidemic. 1. Food Desert Locator. USDA.gov. [Online] [Cited: November 22, 2011.] http://www.ers.usda.gov/data/fooddesert/about.html#Defined. 2. 1. “Food deserts”—evidence and assumption in health policy making. Cummins, Steven and Macintyre, Sally. 10, s.l. : BMJ, 2002, Vol. 325. 3. Lindeberg, Staffan. Food and Western Disease. UK : John Wiley and Sons, 2010. 4. Masterjohn, Chris. Wheat Belly: The Toll of Hubris on Human Health. Cholesterol-and-Health.com. [Online] October 12, 2011. [Cited: November 26, 2011.] http://blog.cholesterol-and-health.com/2011/10/wheat-belly-toll-of-hubris-on-human.html. 5. Daniel, Kaayla T. The Whole Soy Story. Washington, D.C. : NewTrends Publishing, Inc., 2005. 6. Masterjohn, Chris. Nonalcoholic Fatty Liver Disease. WestonAPrice.org. [Online] April 1, 2011. [Cited: September 18, 2011.] http://www.westonaprice.org/health-issues/nonalcoholic-fatty-liver-disease. 7. Jaminet, Paul. Perfect Health Diet. s.l. : YinYang Press, 2010.
eToro is the #1 forex trading platform for newbie and advanced traders. Ladies! Your sexual sensations can now be escalated to gratifying levels. Click on the link beside, Fenhancement.com for Provestra reviews and results. Welcome to the Rapid PT Blog! Foodily: Great Meals are just a Click Away!